We’ve made this video to show you how to fix the ‘Can’t Open File’ error on Google Chrome when downloading .apk files on Android. This tutorial works not just for the FrostWire installer but for any app installer (.apk file) you may have had to download from a website, and it works for every Android phone or tablet. There’s no reason why Google Chrome should be blocking the installation of .apk’s with their browser which happens to be the default of most phones out there, any app can handle opening .apk files, Google has simply decided to have more control of the android ecosystem and is trying to force everyone to use their Google Play market. 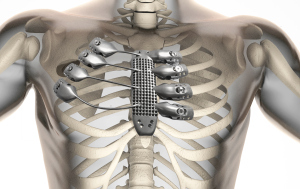 A Spanish cancer patient has received a 3D printed titanium sternum and rib cage designed and manufactured right here in Australia. Here’s how the 3D printed sternum and rib cage fit inside the patient’s body. In this century, learning new stuff is easy thanks to technology. Right now, you can read the oldest books and watch video courses totally free. Here on FrostWire we always support free learning and we love to share Creative Commons content. So if you want to start learning through FrostWire, the first thing you need to do is download and install FrostWire for desktop or Android. Then you can download millions of free (licensed under public domain and creative commons) books, movies, software, music, indexed by Archive.org. FrostWire searches for content on Archive.org so you can download easily all their files. For example, you can read all Shakespeare’s plays or the notes and texts of Sir Isaac Newton. Also if you want to write about old movies, you can watch for free Classic Films like Chaplin’s movies. A New FrostWire for Android is Ready for Download! This new release has a lot of fixes (EZTV, BtJunkie search, torrents issues, crash on audio player), also we upgraded Picasso library for image caching and did a significant update to the jlibtorrent library that improves memory handling and avoids a DDoS attack on the network. The update is currently being rolled out in stages to a small percentage of users on Google Play so that we can fix any newly introduced bug without impacting the majority of users.